Family friendly policies can backfire on women. 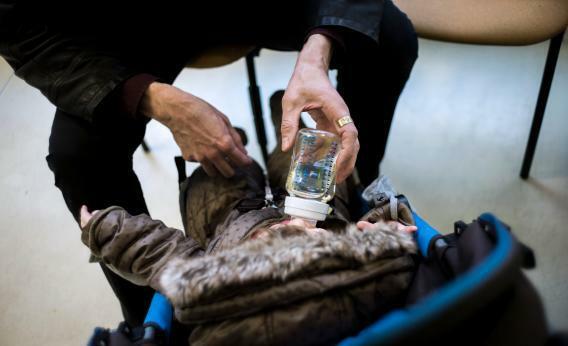 Jean-Philippe, a father of a 10 month-old daughter, gives water to the baby in a child care center, on February 20, 2013 in Paris. Claire Lundberg has a great piece about how despite—or in many ways because of—France’s extensive regulatory support for working mothers, it’s actually really difficult for a mom to get a job. Basically the more you do to force employers to support the needs of working moms, the more costly you make it to hire a mother or really any woman who you think is likely to have children. In 1990, the US had the sixth highest female labor participation rate among 22 OECD countries. By 2010, its rank had fallen to 17th. We find that the expansion of “family-friendly” policies including parental leave and part-time work entitlements in other OECD countries explains 28-29% of the decrease in US women’s labor force participation relative to these other countries. However, these policies also appear to encourage part-time work and employment in lower level positions: US women are more likely than women in other countries to have full time jobs and to work as managers or professionals. In other words, these policies get mixed results. It’s worth noting that as ever with welfare state initiatives, program design matters. One issue with the French approach seems to be that by attempting to shift the incidence for family benefits onto employers, they’ve created a situation where employers succeed in shifting a fair amount of the load back onto workers. If the idea is to have non-parents subsidize parents (which I think makes sense) the best way to do that is to have everyone pay taxes and then have tax dollars pay for parental benefits. Right now we finance public schools with tax dollars. If you imagine a situation in which we stopped doing that and instead mandated that employers pay for their employees’ kids’ school fees, you can quickly see that this “benefit” to parents would create a lot of problematic distortions.